In fact, in 2011 we will ship more new products than in the last three years, combined. Here’s why: the Xobni Cloud. We’ll go into our new cloud platform a bit more below, but first, let me tell you about the new Xobni 2.0 and Xobni Pro. Together, they allow you to seamlessly manage thousands of relationships and allow us to provide you with powerful tools for your inbox and smartphone. Xobni for Outlook v2.0 includes hundreds of updates, improvements and new features from our v1 product. It sports a fancy new grey skin, which makes Xobni look a bit more at home in Outlook. It includeslight-weight access to our new Spam Rescue feature, which looks through the junk folder for any emails that may have been incorrectly quarantined by Outlook. It also includes a number of key speed and stability enhancements. Xobni for Outlook v2.0 is available now for free. You can learn more and download it here. Xobni for BlackBerry v2.0 is the free version of our award-winning automatic address book and lightning fast search app for your BlackBerry. We have wiped out all the complexity of upgrading to our premium products with one unified premium level – Xobni Pro. With one low monthly or annual fee, you have personal access to as many of our Pro products as you need – the list of platforms Xobni supports will grow rapidly this year. As a Xobni Pro subscriber, you can run the Pro version of our Outlook product on multiple machines at no additional charge. Same is true for our BlackBerry app. In fact, as new versions of Xobni come out for other smartphones and inboxes, you get all the Pro versions at no additional cost. Xobni Pro for Outlook is the premium version of our Outlook product, and it is perfect for both email power users and for those for whom managing relationships is their business. It includes a number of great upgrades to the free version, including the ability to export a Xobni Contact to your Outlook address book. It also offers unlimited access to our new Spam Rescue feature, which looks each day for incorrectly junked emails and automatically rescues them. Xobni Pro includes our Xobni Rank-powered AutoSuggest feature (favorite feature by users), access to shared events with a contact, and allows search in unlimited PSTs. And our Pro product sports a beautiful new blue skin, so it looks like Outlook’s better-looking cousin. Xobni Pro for BlackBerry is the premium version of the BlackBerry product: it includes advanced search, customization, unlimited access to our magic autosuggest in your email compose window, and the ability to export Xobni contacts to the BlackBerry address book. The key to Xobni Pro and the many new products and platforms you will see from us in 2011 is Xobni Cloud (replacing Xobni One). It is the most fundamental step forward for the company since it started five years ago. The Xobni Cloud is our new highly secure, scalable and smart platform, and it delivers three key elements to our products: Smarter. Faster. Connected. The Xobni Cloud is easily the smartest product we’ve ever released, and because it is in the cloud, it gets smarter daily. It has new intelligent algorithms on merging contacts, which is really important as you link Xobni to multiple inboxes and platforms. The Xobni Cloud reduces the work done by many features and products, making them faster, more reliable and less resource intensive. It also allows our product team to deliver new products and features to you faster than ever and enables us to launch products in places we couldn’t go before, like Gmail, iPhone, Android and more. Accessing the power of Xobni in more places has been the single biggest request from customers over the past eighteen months. Xobni Cloud connects you to your relationships. Your life and your relationships aren’t siloed into one email account or one device. 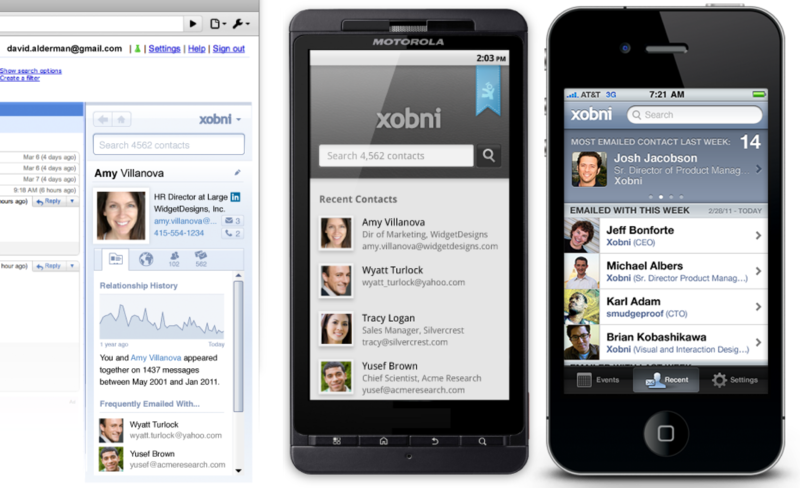 With Xobni Cloud and Xobni Pro, the people you interact with can span multiple inboxes, devices, jobs and even years. It is incredibly powerful, and it only gets more powerful over time. If you are ready to get Xobni Pro, sign up here. Want to test the waters or don’t need all the power of Pro? Download Xobni’s full suite of free products. I’ve answered some of the frequent questions I receive from our current customers below. If you have more, we have a few FAQs online. And, of course, you are welcome to visit our community support or contact our fast, friendly and helpful support team. If I am happy with Xobni Plus now, can I just stay put? Yes. We will continue to provide support for our Plus and Free users on v1.x releases of Xobni. Your Plus license offers “perpetual” access to those features on our v1.x releases. Why the move to subscription vs. version licensing? There are four reasons why we moved from a perpetual license model to a subscription model: release new features and platforms faster, simplify our premium offerings, make the system smarter, and allow it all to work together. In the old model, we had to hold back big improvements and features for the next big release, so we could deliver the value that warranted a new version license fee. Moving forward, we want to release great new features when they’re ready, and we want to make sure all our customers are using the latest and greatest from Xobni. With version licensing, many users stay behind causing significant development and support difficulty. As evidence of the long term complexity of this, consider Microsoft Office. There are four major versions in use today: pre-2003, 2003, 2007 and 2010. So each version has to get updates and QA against each other. Backwards compatibility becomes very complex, etc. About 50% of all Office users are still on Office 2003 or earlier! We knew that 2011 was our year to expand Xobni to more platforms – and the new model sets us up to manage this much more elegantly. Plain and simple: for $4.99/mo (when you buy annual subscription), you get the Pro versions of all of our products. Today this includes premium versions of Outlook and BlackBerry, and soon much, much more. Considering over 80% of our customers have a smartphone and over 90% have at least two email accounts, this is a simpler path for users and helps us to deliver more value, quicker. Is the new Xobni Cloud secure? We have very demanding customers, including many government agencies like NASA and the US Army…not to mention over 90% of the Fortune 500. We have a lot of scrutiny on our security and system integrity. We take your privacy seriously. If you’d prefer, you can go Pro and opt out of us storing any data of yours in the cloud (though that kills the working across products and backup benefit). You can learn more here. To view more FAQs, click here. Since the launch of the BlackBerry Torch and OS 6.x for BlackBerry, the most common request from our users, partners and friends at RIM was support of Xobni for BlackBerry on OS 6. And today we’re happy to give it to you. 🙂 Xobni now officially supports OS 6.x and fully integrates with the Torch for an Optimal Xobni experience. The introduction of the touchscreen enhances the way the users can invoke, scroll and view their automatically generated Xobni Contacts. In addition, we’ve included significant enhancements, improvements and fixes for the updated Xobni for BlackBerry app, thanks to user feedback and testing. We will be making this available at: bb.xobni.com, App World, Mobihand, Handango, Getjar and PocketGear (Note: some stores may take a day or so to reflect the update). Fixes for scanning emails, sms, etc. We’ve been proud to get rave reviews in the media and with our blogger friends, but we couldn’t do it without you. Please continue to improve Xobni Mobile by sending feedback directly from the app by clicking the “Contact Xobni” menu item. As evidenced in the notes above, we listen! J’ai le plaisir de vous annoncer la sortie de la version Xobni pour Outlook en Francais ! L’encadré Outlook qui vous permet de consulter votre boite de réception et d’y trouver rapidement et facilement les informations nécessaires relatives à vos contacts, est désormais disponible en Français. Environ 50% des utilisateurs Xobni se trouvent hors des État-Unis. Suite à un succès de lancement sur le marché Allemand en début d’année, nous sommes maintenant heureux de présenter la version Française à notre base d’utilisateurs particulier et d’entreprises qui ne font qu’augmenter. Ceci élargit aussi nos efforts pour étendre Xobni de manière globale et assurer une augmentation croissante des utilisateurs Internationaux et Europeens. Cette version vient équipée de merveilleux gadgets désormais disponibles sur notre version 1.9.5 annoncée récemment (comme Flickr et YouTube). Un processus d’installation en Français (si vous possédez le système d’exploitation en Français), et l’option de choisir l’interface Française, Anglaise, ou Allemande. 90% de Xobni, comprenant une vidéo d’introduction en Français et tous les formes générales d’interface, a été traduit en Français. Les gadgets localisés pour l’aide, YouTube et Flickr en Français. Basculez à tout moment entre le Français et l’Anglais grâce au menu de Xobni Options. Toutes les fonctionnalités et les gadgets 1.9.5 récemment annoncées. Cette version de Xobni pour Outlook 1.9.5 comprend aussi quelques correctifs de problèmes mineurs depuis la dernière version 1.9.5 dans les parties d’AutoSuggest ainsi que l’affichage gadget. Nous ne fournissons pas pour le moment le support utilisateur complet en Français, mais nous ne manquerons pas de poursuivre nos efforts pour accompagner chacun de nos utilisateurs. Veuillez essayer notre version en Français et nous espérons que vous en tirerez l’expérience Française de la version Xobni 1.9.5 et les Gadgets sous Outlook. Les enterprises interessées à l’amélioration de la productivité au travail peuvent contacter notre groupe de vente Entreprises au +1 (877) 899-6264 ou remplir le formulaire suivant. Toujours en version Anglaise, nos utilisateurs Français pourront essayer Xobni for Blackberry et Xobni One pour avoir une expérience totale de Xobni et accéder ainsi à leurs contacts où qu’ils se trouvent. I’m pleased to announce the release of Xobni for Outlook en français (In French). The Outlook sidebar that makes searching your inbox and finding information about your contacts fast and easy is now available in French ! About 50% of Xobni users come from outside of the US. After a successful German launch earlier this year, we are now happy to bring a French version to our growing French user base and enterprises. This also furthers our effort to expand Xobni globally and support a growing International and European user base. This version will come armed with all the wonderful gadgets available in our recently announced 1.9.5 release (such as Flickr and YouTube). A fully localized French installation process (if on a French OS), and option to choose the French, English or German interface. 90% of Xobni, including the intro video and all major aspects of the interface, has been translated into French. Localized gadgets for Yelp, YouTube and Flickr in French. Switch between French and English at any time via the Xobni Options menu. This build of Xobni for Outlook 1.9.5 also includes some minor bug fixes since the last 1.9.5 build in the areas of AutoSuggest and gadget display. We do not yet provide full customer support in French, but we will continue to improve upon this and always make an effort to help any of our users. Please give Xobni a try en français and we hope you’ll enjoy the French experience, 1.9.5 Xobni version (build 12633) and Gadgets in Outlook. French enterprises interested in increasing productivity in the workplace should contact our Enterprise Sales team at +1 (877) 899-6264 or fill out our Enterprise request form. Although still in English, our French users should try out Xobni for Blackberry and Xobni One to complete the entire Xobni experience and have access to their contacts wherever they go. Earlier this year, Xobni announced that we would be porting the OpenSocial-powered Gmail Contextual Gadgets into Xobni for Outlook, and made a preview version available to developers. Today we are releasing Xobni 1.9.5, which includes a taste of Xobni Gadgets for the public to enjoy. Scores of developers have approached us about creating workplace gadgets that increase productivity and collaboration. We’ll be working with trusted developers over time to make their gadgets available to millions of Xobni and Outlook users. Today, the first reference gadgets that are available are Flickr, Yelp and YouTube. How it works in Xobni 1.9.5: When an email is sent to a Xobni user that includes a Flickr photo link, YouTube video link or Yelp business listing link, a rich preview of each link will appear at the bottom of the email. Sometimes a preview is all you need to save the seven-second trip to the browser. Other times, the preview will simply be a quick way to click straight to the full browser page. If an email contains multiple links (see picture below), we’ve created a tabbed experience to preserve precious screen space. Of course, the Xobni Gadget bar at the bottom of messages easily expands and contracts as needed, and can be turned off through Xobni Options. Over time, new message and sidebar gadgets will become available to users through the Xobni Gadget Manager, which is accessible through the Xobni options. Developers interested in making their products/services available in Outlook can go to http://www.xobni.com/developer to learn more. Note: After you download, you will be prompted to close Outlook and the new Xobni version will be installed. All of your data (Xobni profile merges, contact information entries) will be maintained, no matter what version you are using currently. Update: Version 1.9.5 was first released October 12th with a build# of 12548, but was updated on Oct 19th with build #12601, which addresses an issue fetching Facebook photos.